Recent Comments submitted by the State E-rate Coordinator Alliance (SECA) to the FCC highlight the growing role of state matching funds in broadband initiatives. Based on applicant-reported data, Funds For Learning estimates that over the past three years states have offered more than $48 million in matching funds to spur investment in broadband connections. E-rate regulations encourage state investment in broadband connectivity by offering applicants additional E-rate support to match funds provided by their state for wide area network special construction costs. The E-rate program will match a state’s extra support by up to ten percentage points. For example, if an applicant’s broadband network qualifies for a 60 percent discount on special construction and its state offers to cover 10 percent of the cost, then the E-rate program will match the state’s support, providing an additional 10 percent. The net effect for the applicant would be an effective discount rate of 80% for the one-time special construction fees associated with the project. The state matching fund program was first implemented in funding year 2016 and it has been steadily increasing in popularity as states pass legislation and implement programs to hasten the deployment of broadband networks. 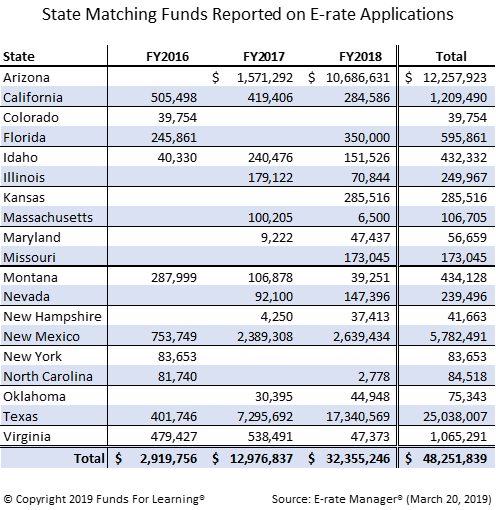 In 2018, there were 168 E-rate applicants in 17 states that reported projects involving matching funds. The total cost of these projects was $370.21 million, with applicants reporting a state match of $32.36 million. 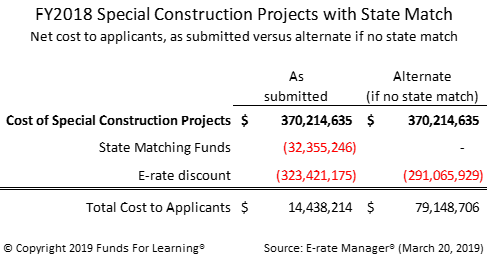 With the corresponding increase in E-rate discounts tied to the state match, the net cost to applicants for these projects would be $14.44 million. Without the state match and extra E-rate discount, the total cost to applicants for the same projects would be $79.15 million, nearly five-and-a-half times more expensive.